Things are really getting going now amongst the various referendum campaign groups, as David Cameron meets his counterparts in Brussels to try to agree a final package, before heading to the polls. In this week’s analysis, we’re looking again at the social media output, trying to unpick what each group is talking about and how. In particular, we’re keen to consider how far the charges of negative campaigning really stand up and how the messaging highlights different areas. As in our previous analysis, we’ve taken all of the tweets from each group actively and primarily campaigning on the referendum: that list is now up to nine, with the inclusion of two Conservative groups. The period analysed is the seven days up to the end of Wednesday 17 February. Negative references to other groups. This includes groups on the same side (although this week’s sample did not contain any of these). 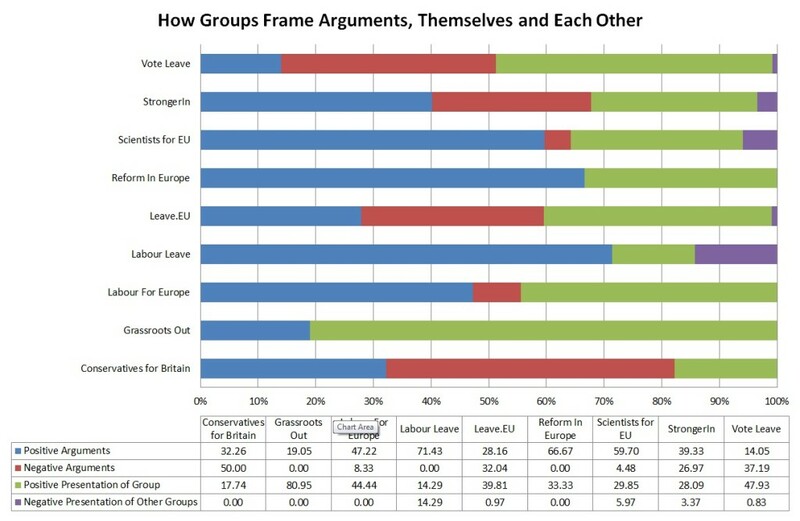 As you can see, this matrix tries to separate out the substantive points from the campaigning, something that has long been a clear division in the structure of the referendum debate. Remember that all the groups have one clear goal, namely to win the referendum, so we would expect to see a variety of ways of doing this. While some will want to accentuate the value of their preference, others will focus on the dangers of going the other way, while others still might choose to question the ability of their opponents. On a methodological point, we have not created a neutral category, as we find very few such instances of no value being imputed – these have been coded as positive when they do occur. We make not particular value judgement about the merits or otherwise of negative campaigning, but would merely note that there are some strong incentives to engage in it in a one-off referendum, where ad hoc groupings spring up and the longer-term impact on reputations is quite limited. In a contest with a binary outcome (leave or remain), ‘doing what it takes’ might seem to be a credible option. 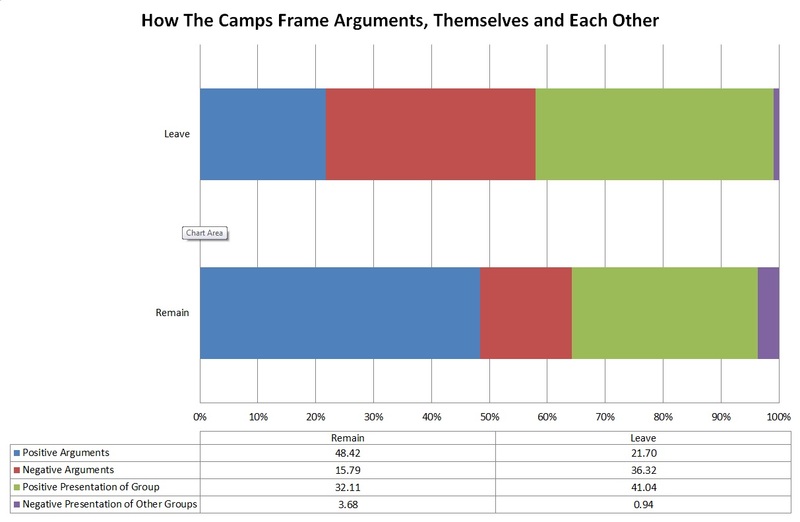 In the charts below, we show firstly the breakdown on our matrix for each group, and then for each camp. As you can see, there is a wide variety of content between the groups. 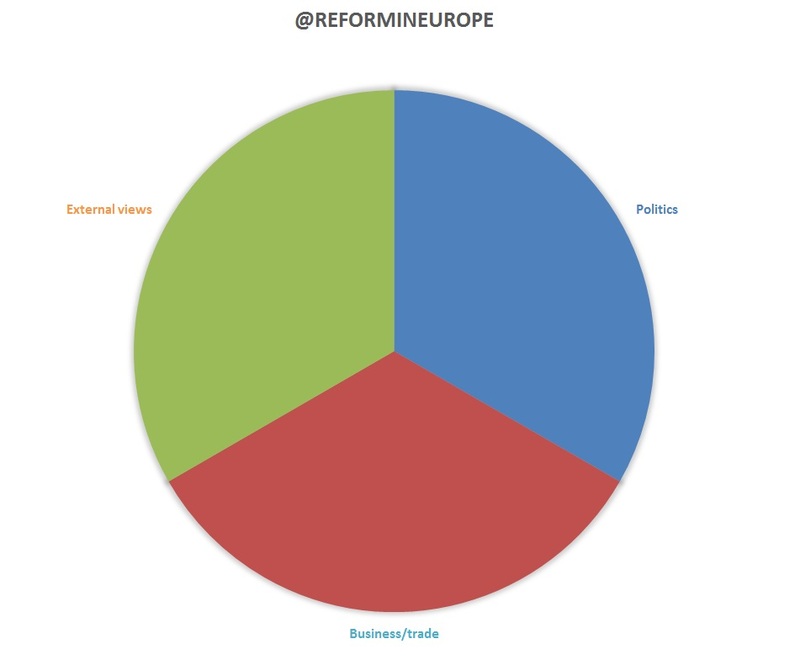 While Reform in Europe and Grassroots Out only produced positive tweets during this time period, there was a lot of negative messaging from Conservatives for Britain and the three main groups (Vote Leave, Leave.EU and StrongerIn). Mostly, negative messaging was on substantive points, and the costs of making the wrong choice, rather than on attacks on other groups. 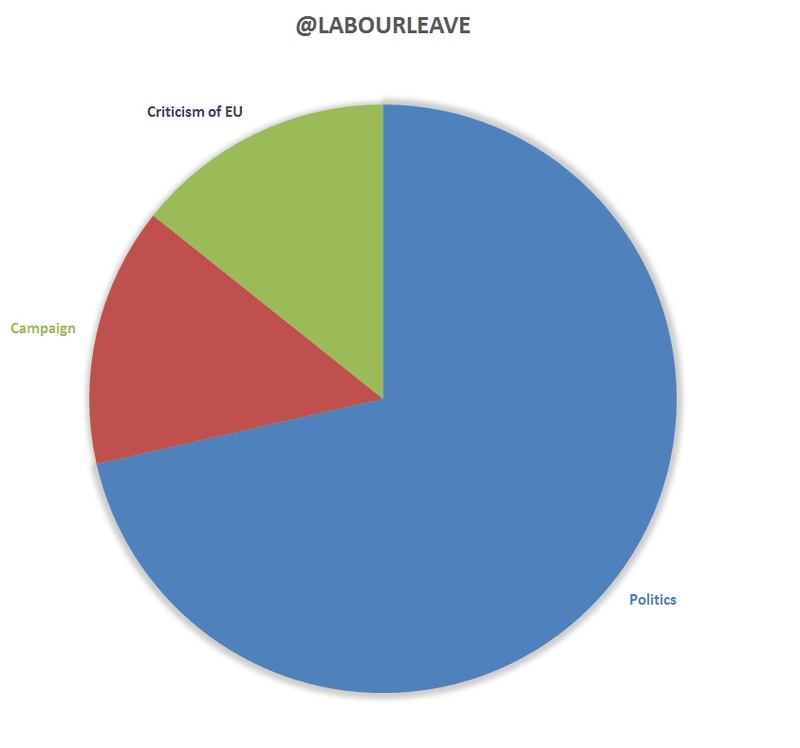 In our weighted average for the two sides, we see that both make about 60% of their tweets about substantial arguments, with Leave making more on the costs of membership, leaving 40% for references to themselves and others. These are overwhelmingly about the success of setting up new groups, canvassing or events, with only a handful (9 tweets in all) saying anything negative about others. 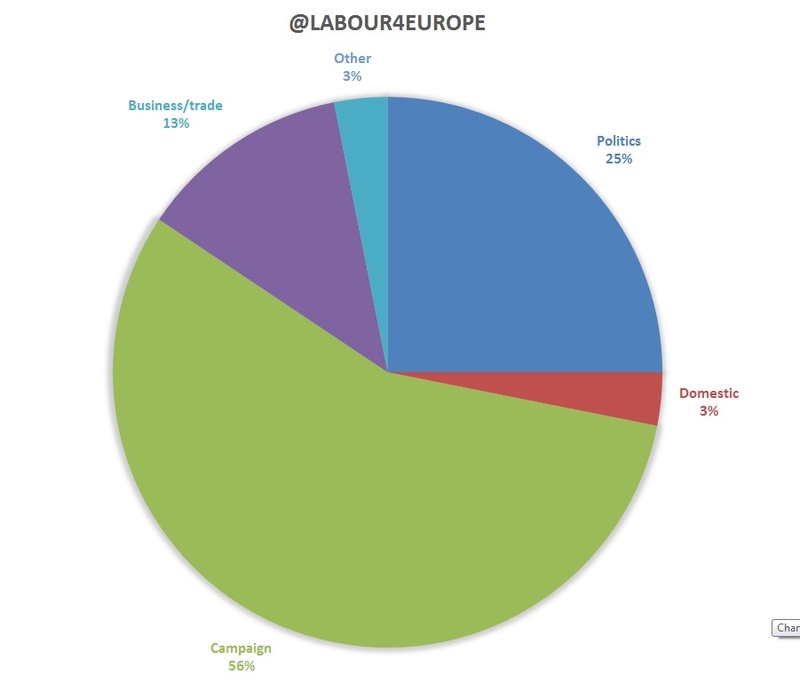 Even Labour Leave, who have the highest percentage of negative comments about other groups, only achieve this because one of their seven tweets this week was critical of the Labour party: hardly a wave of ad hominem attacks. Thus we need to be careful about the charge of negative campaigning. While there is a good deal of negative messaging about the dangers of not going along with a group’s preferred outcome, this does not extend to more personal attacks on other groups’ competence or approach. What do groups talk about? All the twitter accounts had at least 20% of their tweets related directly to their campaign, including campaign news and events. 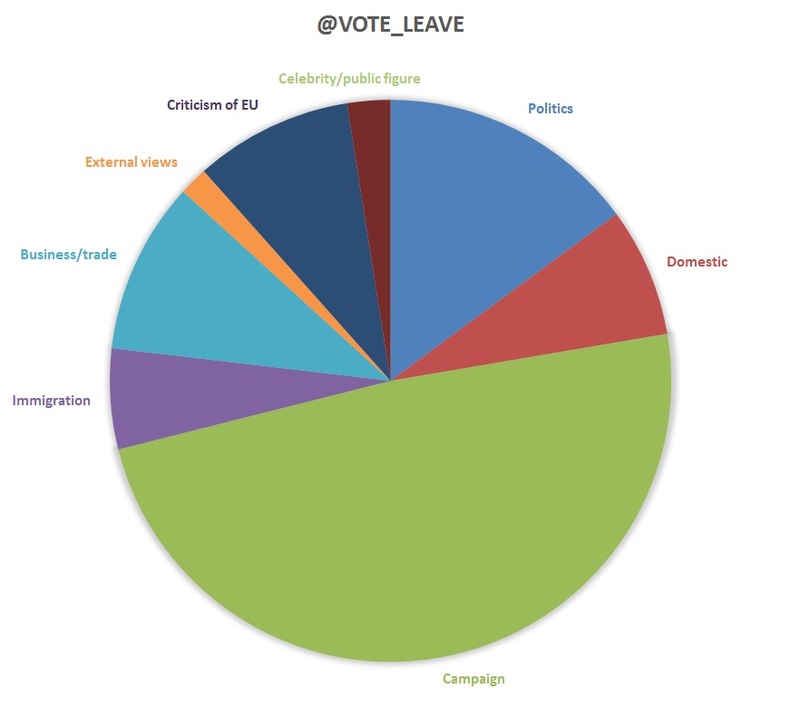 In particular, the majority of @vote_leave and @LeaveEUOfficial tweets were campaign related. This is unsurprising given that the campaigns are trying to build a support base. 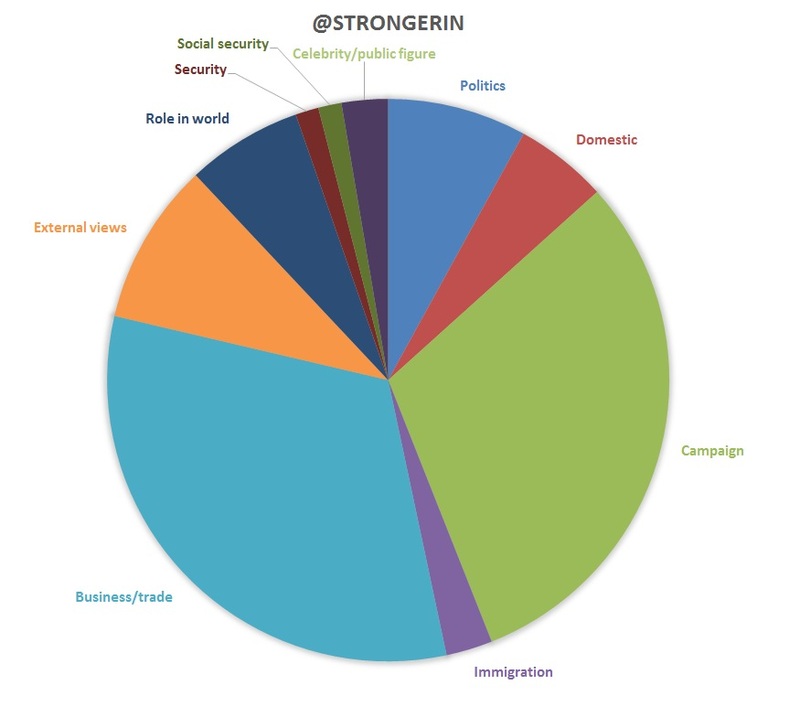 The campaigns linked to political parties dedicated the greatest number of tweets to politics, with the non-affiliated campaigns largely avoiding this theme. 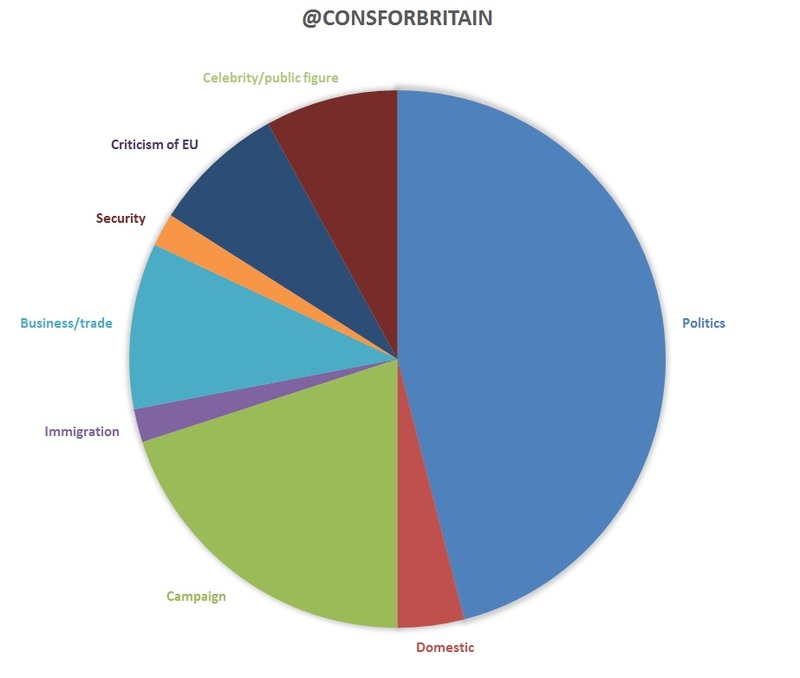 For example, the majority of the tweets from @consforbritain focused, perhaps unsurprisingly, on politics. 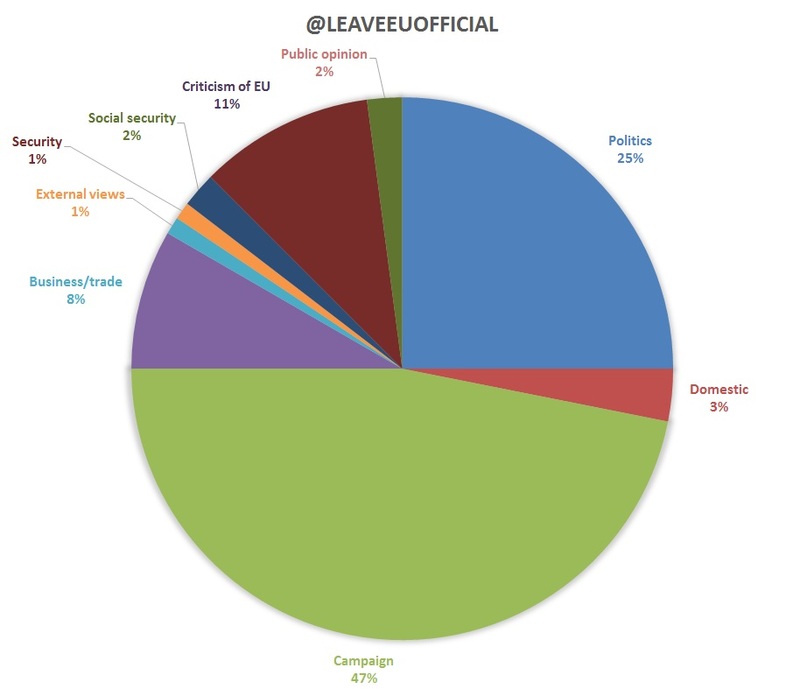 The exception among the non-aligned campaigns was @LeaveEUOfficial, with 25% of its tweets focused on political issues. In particular, they criticised the Prime Minister and the deal with Brussels. Immigration cropped up as an issue for both the in and out campaigns. @vote_leave gave the strongest focus to the issue with 6% of their tweets dedicated to the topic and an argument which included the contention that “the EU’s open-border policy ‘is likely hanging a sign welcoming terrorists to Europe’”. @Scientists4EU and @StrongerIN also looked at the issue, suggesting EU membership was the best way to deal with the ‘#migrantcrisis’. Security did not feature prominently in the tweets this week from either side, with only @consforbritain, @StrongerIn and @LeaveEU making a minimal reference to the issue. This could reflect the absence of the issue from the news this week, although this is one to watch, given David Cameron’s interest in pressing this agenda. 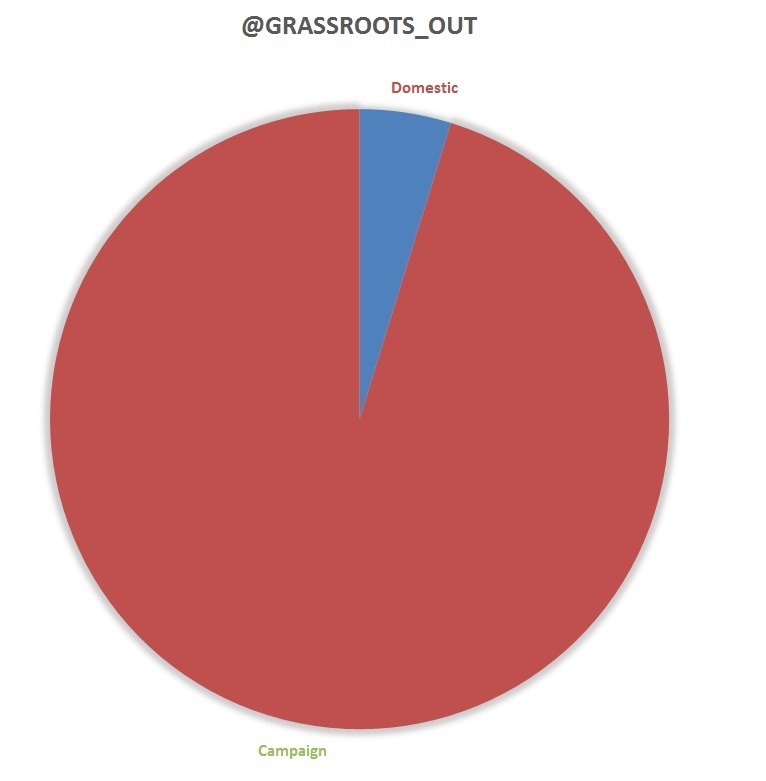 With the exception of @grassroots_out (which only produced 21 tweets), all of the out campaigns dedicated between 8% and 14% of their tweets to criticising the EU. 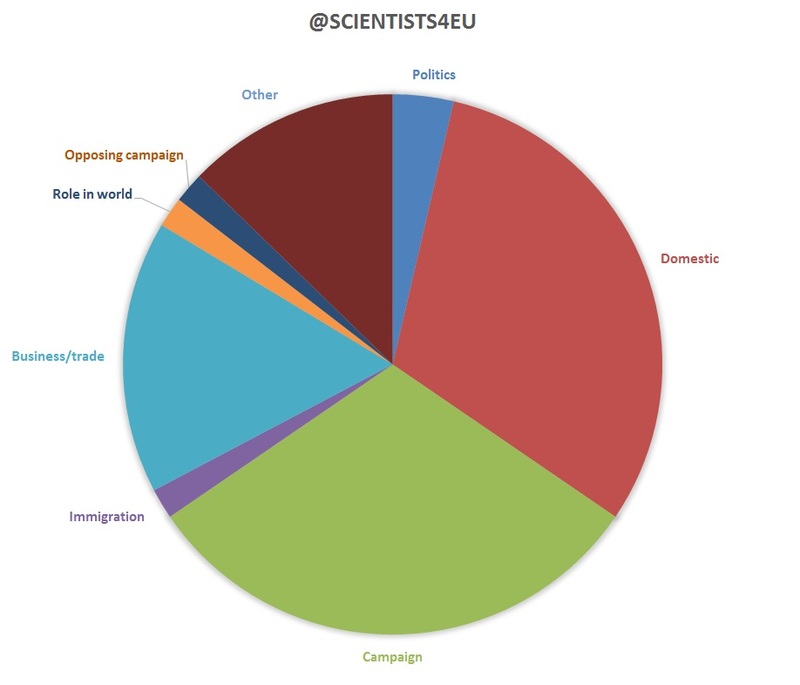 Similarly, the in campaigns dedicated between 10% and 11% of their tweets to extolling the virtues of EU membership. The exception being the Conservative campaign to stay in (@reformineurope) but this account only produced 3 tweets. Business and trade featured in most the twitter feeds but with the exception of @StrongerIN’s tweets this week (where it was most tweeted about issue), the issue did not dominate.